Prone to breakouts on one side of your face or do you just hate when your phone screen is dirty? Well its probably time to clean your phone! Take a cotton ball or piece of tissue and spray with a little glass cleaner & wipe the screen of your phone! Try doing this several times a week. It helps to keep your phone screen clean & free from bacteria! 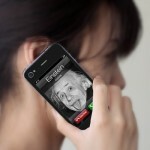 (SN: I thought this pic was funny…it’s a decal that makes it look like your talking on the phone backwards…lol)! « Happy Birthday Pretty Lady!